Due to blue buildings around Mehrangarh Fort, Jodhpur is also known as Blue City. Rajasthan is a popular tourist destination, offering a rich cultural heritage, Jodhpur Tourism is a rich industry on its own in this destination. 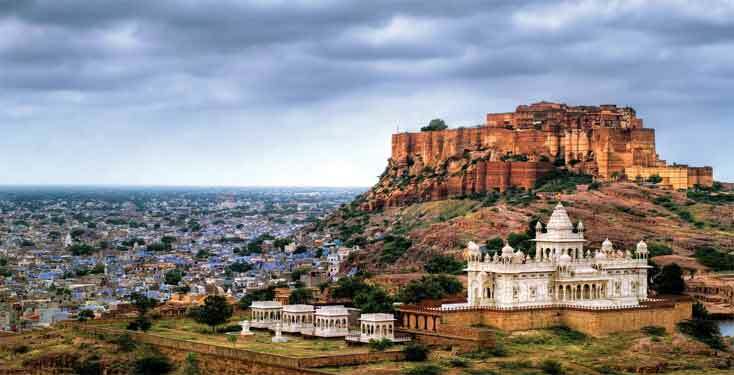 We offer a wide range of Jodhpur tour packages. These Jodhpur packages are designed specifically according to budget and in line with other personal needs of all types of tourists. The pioneer name in the tour package area in Jodhpur. Jodhpur's largest tourist attraction, and the Jodhpur tour packages are essentially a specialty, for the famous Mehrangarh Fort. Located on the top of the hill, Mehrangarh Fort is also called Jodhpur Fort or Jodhpur ka Qila. Another important tourist attraction in Jodhpur is the Umad Bhavan Palace. Mehrangarh Fort along with Umad Bhawan Palace is a special feature of all types of Jodhpur packages. For those interested in the royal family and the pedigree of Jodhpur, Jaswant is a memorial to visit Thada. Built in memory of Maharaja Jaswant Singh II, Jaswant Thada is one of the most attractive structures built in marble in Rajasthan. As a cone of the Maharaja, Jaswant Thada has been designed like a tomb, even if there is no deadly relic of these. Apart from Cenotaph, there are other graves even inside the Jaswant Thada. Jodhpur comes from an early grace of Indian trouser called Churidar, which is tight around the hips and around the baggy. In Jodhpur, India, they used the same style and made a suitable punt for the ride. These pants are slightly different from tight hip-hogging riding pants styles that we see today. Sir Pratap Singh, son of Maharaja of Jodhpur, presented the trousers for the first time in England. Singh was a fierce polo player and when he visited Queen Victoria in 1897, he brought with him his entire polo team. Jodhpur, who was worn by him and his team, created a sensation between the United Kingdom's fashionistas. Singh's Jodhpur style was thinner on thighs and hip and calf, which was picked up quickly by the British polo game community, which had converted Jodhpur into its current design, which was like the English Breach which ended under the bull and socks and long rides are worn with shoes. Although the word "Jodhpur" was used for this style, although these are not real Jodhpur and they are called "Flare-Hip Breach". The British versions of these riding pants were being produced in London soon. With the use of Indian style, ankle-length Jodhpur, riders helped save money and long expensive ride shoes are not needed. The leg calves were newly designed and long pants were protected by the lower fit snag, which helped rug the bull's bull against the sides of the horse and against the skin of stirrup. Mehrangarh Fort: Mehrangarh Fort is also known by Majesty Fort which is situated on a 150 meter high hill. According to the legends, this fort was built in the year 1459. The amazing building of the Mehrangarh fort was done by Rao Jodha who was chief of the Rathore dynasty. The old guns displayed inside the Mehrangarh Fort show the historical ruler period of the Jodhpur rulers. Seeing this auspicious site, Jodhpur shows the beauty of the city. Jodhpur Thada is another known tourist destination in Jodhpur city. You can see rare pictures showing the glorious rule of Jodhpur kings here. The bright look of Jaswant Thaeda, made of white marble, pleases the eyes. It was dedicated to Jitwant Singh II king of Sinalop Bahadur Dil, who ruled Jodhpur from 1878 to 1895. Mandor Garden: Beautiful Mandor Garden is 9 km away from Jodhpur city which is another interesting area for tourists. In this garden the sightseeings, such as the historic sculpture from the single rocky pieces, the Cenotaph, and the bush lawn, allow everyone to refresh. 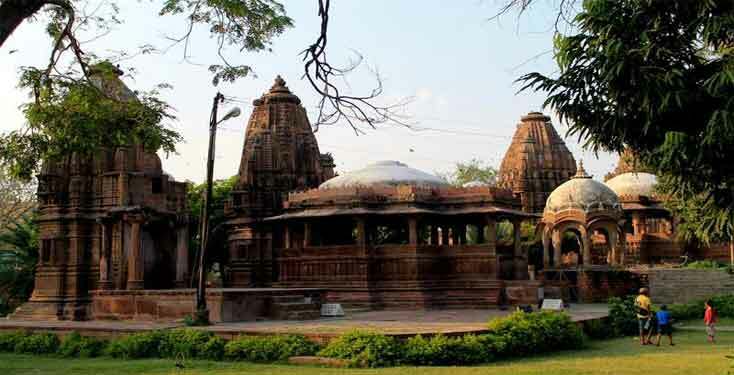 Mahamandir Temple situated on Mandore Road attracts thousands of tourists. The wonderful view of the carved yogi currencies in the attractive pillars seen inside this temple is truly admirable. The classic clock tower decorated with lights in Jodhpur city is another point of view of tourists. 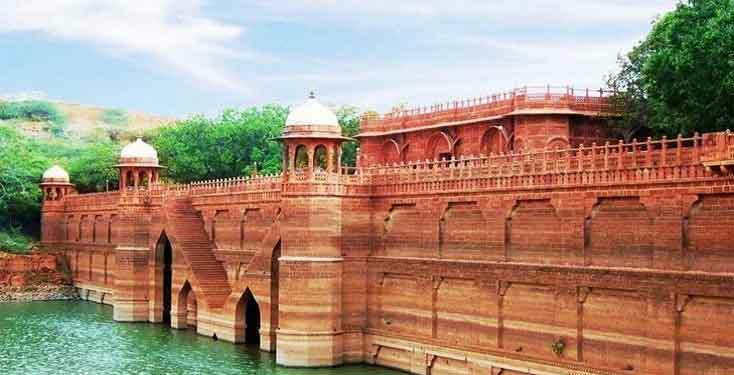 The Balmsmand palace, situated on the banks of the Balsamand Lake, is one of the most famous tourist destinations in Jodhpur. Located about 7 km from Jodhpur city, this beautiful palace was in the summer palace of Jodhpur kings. Located in the southeast part of Jodhpur, Umad Bhavan Palace is one of the most famous tourist destinations. Umad Bhawan Palace: Umad Bhawan Palace, which was built during the reign of Maharaja Umad Singh in the twentieth century, owns a museum, swimming pool, Ramayan murals and wood panel library. The king constructed this royal palace with 347 rooms in Lal Shahi stone. This palace is one of the world's largest private residences. 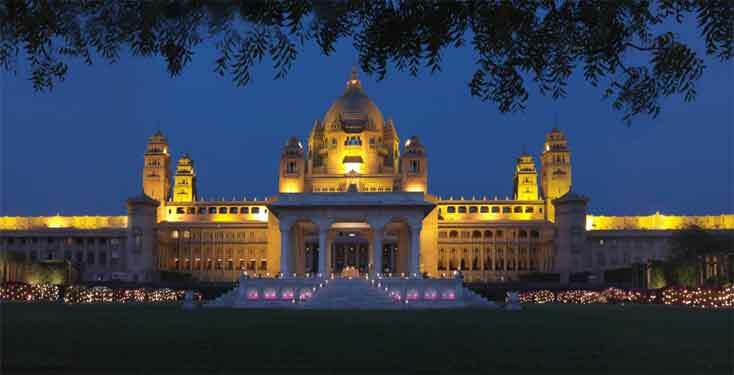 Umad Bhawan Palace is situated in the Chitta Hills, which is one of the top points of Jodhpur. Due to its location in the Chittar hills, the palace is sometimes known as Chittar Palace. Today, the castle is a compilation of the hotel and the museum has been opened for tourists. Inside the castle a rare collection of museum clocks fills the banner, leopard and old weapons presented by Queen Victoria. The Palace was constructed to provide employment facility to the victims of the family. Records say that the palace has already provided employment facility for more than three thousand famine sufferers. The presence of elegant spots in Jodhpur makes this blue city a real paradise on earth. The winter season in Mount Abu isn't as outrageous as other slope stations, supporting the all the vacationer exercises. It is a perfect time for the visit and the climate is lovely to appreciate the touring and to investigate the town. How to reach Jodhpur by Road: It is always a best idea to plan to visit Jodhpur by Roadways. So if you decide to start the journey to Jodgpur, you can get vehicles from several destinations as per the roadways are well connected with Jodhpur from different destinations. How to reach Jodhpur by Train: Travel by train is best, cheapest and most economical option to reach Jodhpur. Rai;way lines are well connected to Delhi, Mumbai, Chennai and Kolkata. Through the trains like Yashwantpur Bangalore Jodhpur Express, Rajasthan Sampark Kranti, Howrah Jodhpur SF Express, Chennai Jodhpur Express, Suryanagari Express and Jaisalmer Delhi Express, you can easily reach Jodhpur. These trains run throughout the year, usually in all days of the week. How to reach Jodhpur by Air: Jodhpur has domestic airport in which the direct flights arrive to and from New Delhi and Mumbai. With the airlines like Air India, Jet Airways and SpiceJet on board for Jodhpur, Jodhpur is the nearest international airport to Jaipur International Airport and Indira Gandi International Airport – New Delhi. Airfare is not very high, because the travel period is very short.